Over a thousand years ago, an Irish holy man called Fintan Munnu started one of the first Christian communities in the west of Scotland here.The cell or chapel of Munnu gave the village its name: Kilmun. 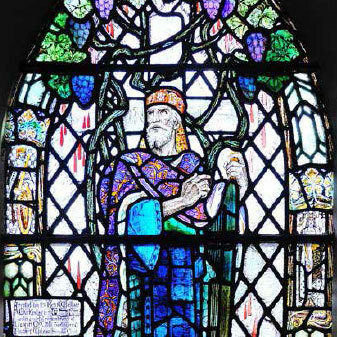 Munnu became a Saint, and his reputation made Kilmun an important sacred place.The powerful Campbell clan, who became Lords, Earls and then Dukes of Argyll, adopted it as their spiritual home.They paid priests to pray for their souls, and their dead are buried in a grand mausoleum. Hundreds of years later, a new church was built to house the tourists who came to Kilmun for its beauty and fresh air. Rich people supported it by paying for colourful stained glass windows instead of prayers. In the churchyard, intriguing gravestones bear witness to the loves, hopes and work of the people who have lived here through the centuries. Today, St Munn’s is an active modern church with a key role in the life of the community. We hope you enjoy your visit to this fascinating place. Thurs, Fri and Sat 10-4pm and at other times and bank holidays by arrangement. By appointment only. Please call 07801 812 610 or contact us via Facebook or Twitter. £3.00 for adults, children under 16 years old free. The church may occasionally be closed for services for up to two hours, so if travelling any distance please check beforehand. Groups or coach parties please notify us in advance and refreshments may be available. If your coach trip is on any other day to this area then please call and we will endevour to make arrangements to accommodate your party by appointment only. When we are closed it may be possible to arrange a visit, but please allow 7 days’ notice. When the Visitor Centre is closed, outdoor information panels will help you explore this fascinating, peaceful place.